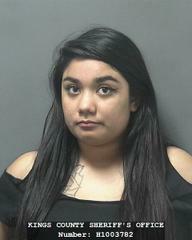 Details: On March 17, 2017, a Corcoran woman reported to the Corcoran Police Department that her niece, Marissa Campos, threatened to kill her as she held a knife up to her neck during an argument. The incident occurred at a residence located in the 2700 block of Orange Avenue on March 16, 2017. On May 9, 2017, at 11:15 PM Campos was contacted in the 2700 block of Orange Avenue and was placed under arrest for the assault. Campos was booked into the Kings County Jail on charges of Assault with a Deadly Weapon, Terrorist Threats, and Battery. Campos is being held on $80,000 bail.